Nutritionists tell us breakfast ought to be the most important meal of the day. The stomach tell us the same thing. We probably all have days when we just ignore the stomach and forget about those nutritionists and their health advice. We are just too lazy or too rushed to sit and eat in the morning, not to mention cooking on top of that. Well, here’s a breakfast that takes about 10 minutes to prepare and 5 minutes to eat. Cut 5-6 salami slices. Dice them, then toss it in a pan with a teaspoon of olive oil. Cook it over medium heat. Chop half of a red bell pepper and add it in the pan. Stir frequently. Take two eggs and beat them. Add a little bit of paprika powder. That’s only for the nice, red color of the food, so you can skip it if you wish. 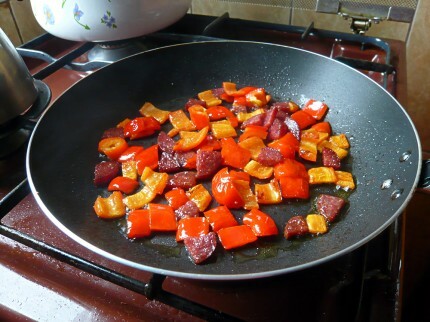 Your salami and red bell pepper should be cooked enough by now, so add the beaten eggs to the pan. Cook over medium heat. 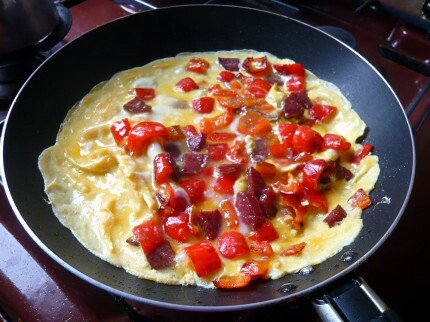 Use a wooden spatula to lift the edges of the omelet, in order to allow the egg mixture to cook evenly. After about 3 minutes flip the eggs, add some grated cheese on top and let them cook for one minute more. 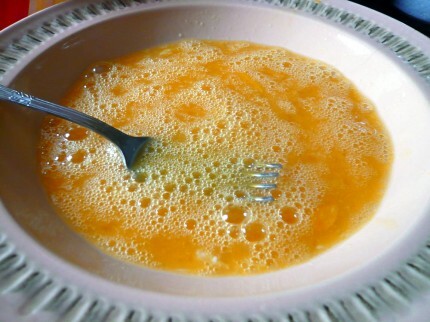 Fold the omelet and transfer it onto a plate. 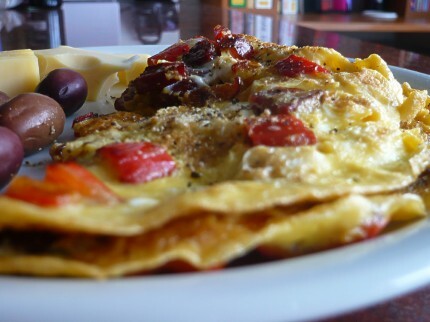 Add a few slices of cheese and a few olives, sprinkle some freshly ground pepper on top and enjoy your fast breakfast. You probably figured out already that you can tweak this recipe in multiple ways. Add whatever you like, leave out what you hate. The main idea is that one needs only 15 minutes in the morning to start the day with a warm breakfast, even if it’s this simple.